Businesses and technology work more hand in hand than ever. Whether technology is helping drive a business forward acquiring and retaining customers, improving the operational performance, improving decision making or running the back office we are not only touching technology more than we have before but in the world of property risk it is an expectation that the technology that is relied on should be leading edge from those supplying it. Lenders, panel managers and surveying businesses must have the ability to access better data to make better decisions and minimise risk at the same time as improve process efficiencies. For some time, there has been under investment in new technology in the survey and valuation markets. While the focus on this part of the mortgage supply chain was toward distribution in busier markets then why all the fuss over better risk management tools? Now with increased emphasis on risk management and managing exposure to those risks for financial, operational and reputational reasons all parties are taking more considered approaches to how to shore up their defences and improve the customer experience in what we should never forget is a fraught process of home buying or remortgaging. The desire of lending and surveying businesses to share data is growing and is something we remain committed to help deliver. 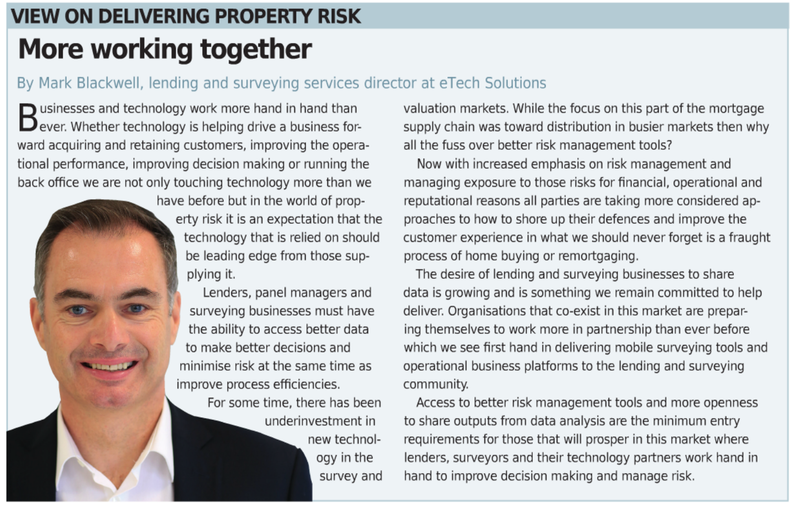 Organisations that co-exist in this market are preparing themselves to work more in partnership than ever before which we see first-hand in delivering mobile surveying tools and operational business platforms to the lending and surveying community. Access to better risk management tools and more openness to share outputs from data analysis are the minimum entry requirements for those that will prosper in this market where lenders, surveyors and their technology partners work hand in hand to improve decision making and manage risk.